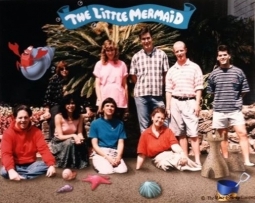 I began as an Animating Assistant on “The Little Mermaid” working with Directing Animator Duncan Marjoribanks in the Sebastian unit. I also animated many scenes of Flounder as well. The Artistic Review Board promoted me to Journeyman Animator (full animator) by the end of production. 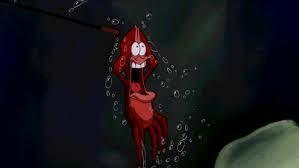 I animated most of the teeny walking and talking and swimming and singing scenes of Sebastian. Directors routinely give apprentices insignificant scenes to test their skills. I was happy to get them and did a great job. At the end of the film, they rewarded me with the sequence of Sebastian conducting the concert of the seven sisters (the one Ariel misses). It had close-ups! My work was of quality, and I animated more footage than some of the journeymen, so I was promoted and given an Animator credit. I learned a lot more about animating in perspective, which contributed to my early thinking in 3 dimensions. I learned the importance of doing a great job even on continuity scenes. Stone sculpture was nothing to me at this time, but I was learning skills that I would translate to the medium. One skill is the ability to sustain a performance over the time it takes to animate a scene. This is exactly the same as sustaining the inspiration it takes to complete a complex stone sculpture. I do see the process of stone carving as a kind of performance. Stone sculpting is completely subtractive and every action counts. There are no rehearsals where you can go back and fix things you didn’t mean to cut away. Meticulous work. As on my stone sculpture “Smile!“.